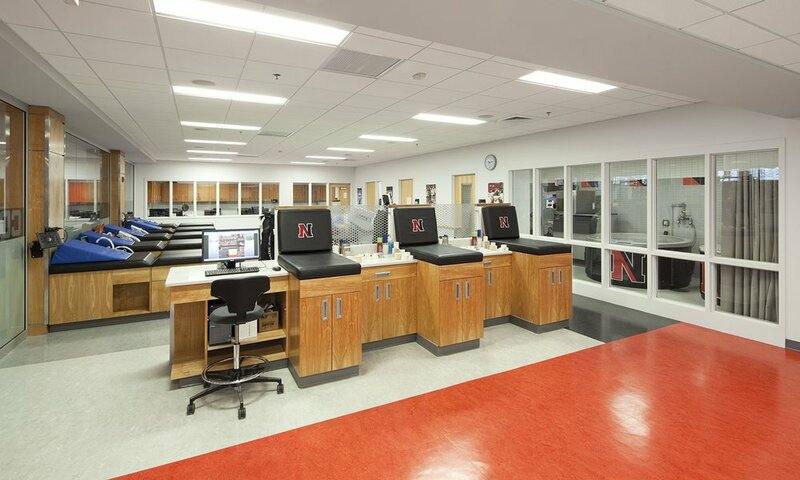 Northeastern University’s Gries Center for Sports Medicine and Performance is committed to providing the finest methods, specialists and programming to enhance and maintain its student-athletes’ health, performance and welfare. The 10,775 sf facility integrates Sports Medicine and Strength and Conditioning to holistically enhance the student athletic experience. In 2011 MDS designed and implemented a renovation that improved strength and conditioning equipment layout and flow of different stations. The new layout improves visibility of the Sports Medicine and Performance spaces and provided a more welcoming space for both students and visiting athletes. Flooring and finishes were designed to be flexible, functional, and safe, and also enhance the identity of the Athletic department’s school branding. The renovation also provided improved office and storage facilities. Care was taken when selecting finishes and materials that did not adversely affect the interior air quality, and were made with recycled content. Lighting is highly efficient, and an effort was made to bring more natural light into the space. Installation of technology and audio visual equipment improved the training capability of the staff and custom made exam tables and taping stations help training and medical staff provide better service to the athletes. Combining injury prevention, rehabilitation and training, the Gries Center holistically addresses the needs of student-athletes' health, wellness and performance.